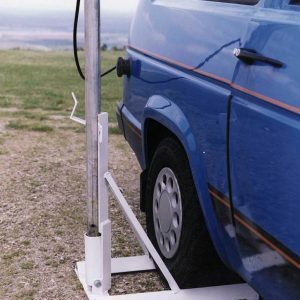 The Tenna Tourer is a drive-on portable mast mounting. Capable of being bolted down as a temporary home base mast mounting. Select the operating site and drive the vehicle onto the mounting, making sure the top of the vertical member is clear of any overhanging bodywork. To erect the mast, simply inserting it with the antennae into the hinged socket, tilt the unit upright, then secure the assembly in the vertical position with the clamp provided.